As retail grocers wait for states to decide how, or if, to label foods, Whole Foods is taking it upon themselves to make those decisions. Last year Whole Foods announced they would label all foods containing genetically engineered ingredients by 2018 in the United States and United Kingdom. This week, they also announced they will be labeling fresh produce and flowers it sells with ratings based on the impact those products have on workers, soil, water, and human health. This is what so many consumers have been asking for and it’s great to see a company take initiative and make the effort to become transparent regarding food production. Hopefully this will encourage other retailers to follow suit. 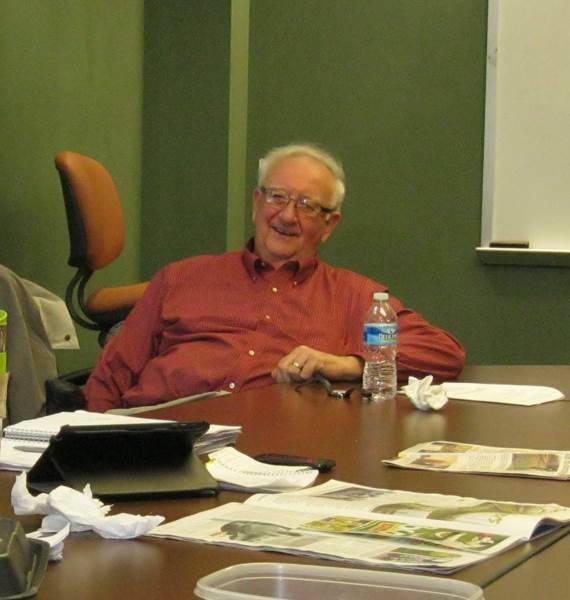 Glyn was a mentor, a leader and a friend. He will be missed by all that knew him and will not be forgotten. 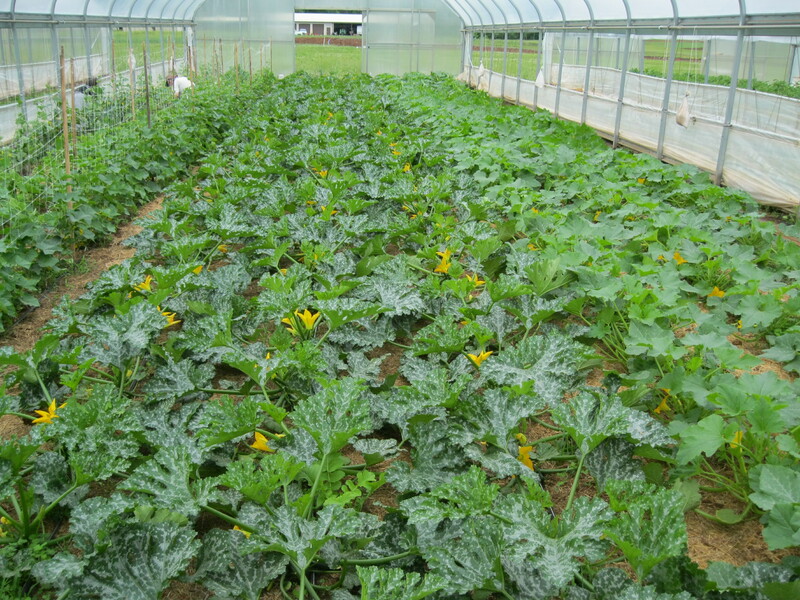 Look at what a month in a high tunnel can do to squash and cucumbers! 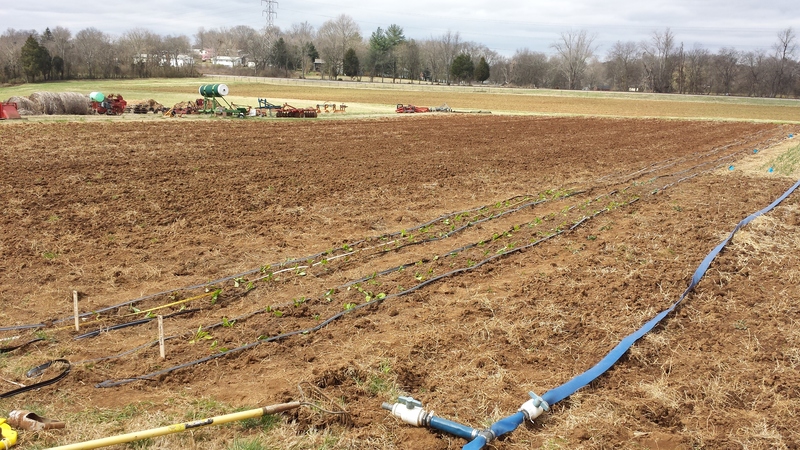 The first picture shows 3 rows of yellow squash (far right), 3 rows of green zucchini (middle), and 3 rows of cucumber (far left). All were transplanted April 16. The picture below was taken May 15! The squash and zucchini plants are a bush type while the cucumbers have a trellis to climb to maximize space. We will begin harvesting squash and zucchini next week! 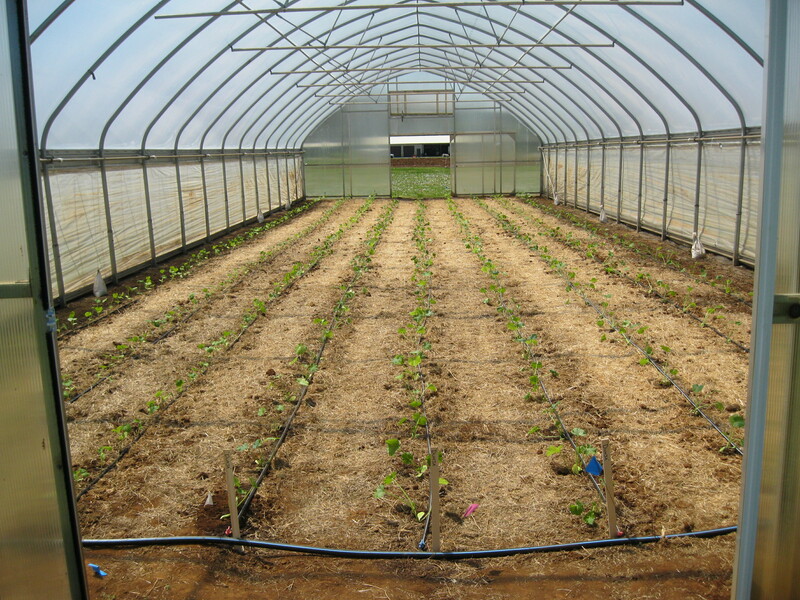 The high tunnel increases the soil and air temperature causing growth to occur more quickly than if they were in the open field. We close the high tunnel at night to retain heat and open the high tunnel on warm days to allow for ventilation. Growing up in middle Tennessee, I was always told the time to plant was April 15th, because that was the day that you were safe from frost. While walking around the University of Tennessee’s campus in the snow this week I was reminded yet again that the weather is unpredictable, and a bane to farmers everywhere . With freezing temperatures in mind, it is important to know how to protect any plants already in your garden. This can be done through a variety of methods. The best defense for plants is to keep them covered. Often this is accomplished by using fabrics and cloth that protect the plant yet allow for air circulation. People with small gardens use sheets and blankets for coverage. Plastic can also be used. 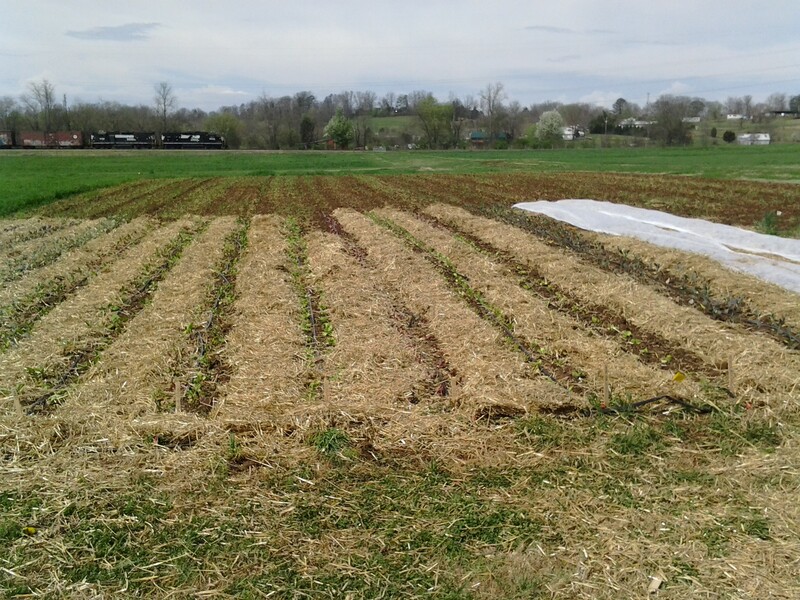 Turner and Sons Nursery, located in Smithville TN, employed these methods this week in order to protect their strawberry crop. 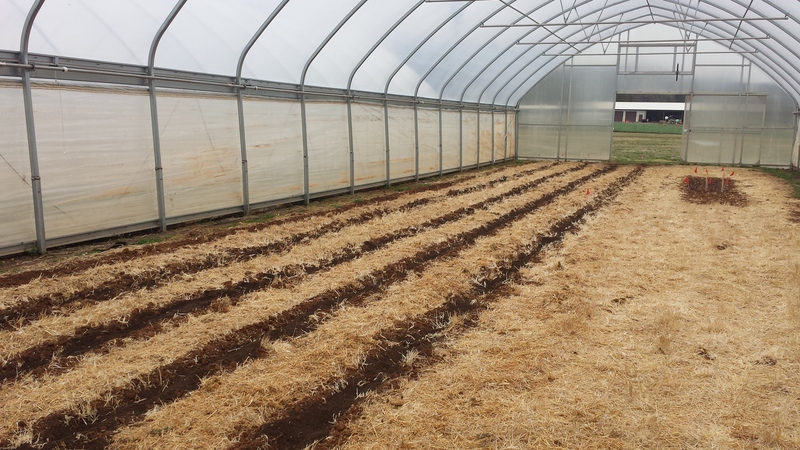 Other methods include covering the plants with straw or mulch. It’s also beneficial to wet the soil around the plants, as water helps to hold in heat. 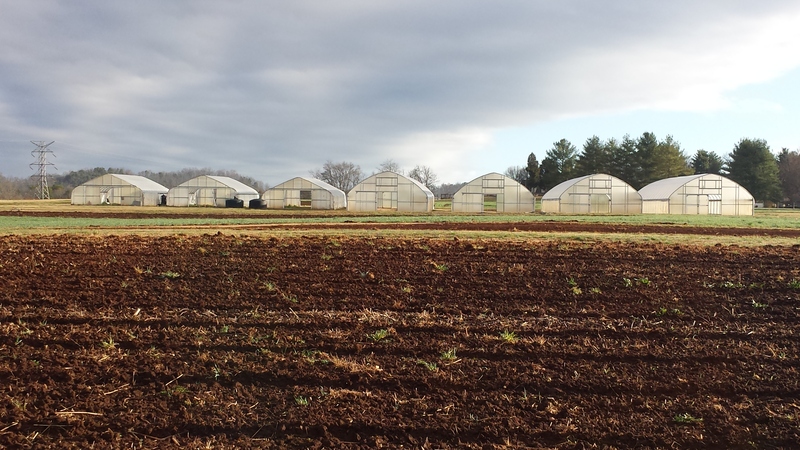 Fortunately, all of the crops planted at the organic farm survived the cold temperatures this week .The interns were hard at work today planting squash, zucchini, cucumber, and tomatoes in the high tunnels as well as onions and potatoes in the field. 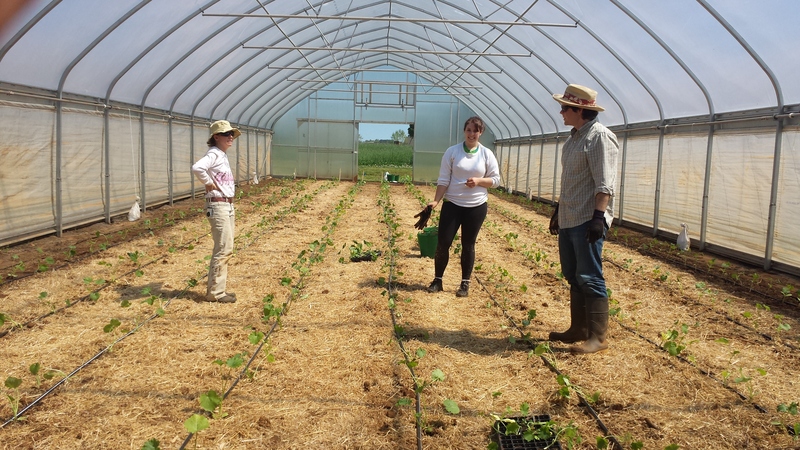 This week is spring break for the students at UT, which has given the interns a chance to do some work on the farm. 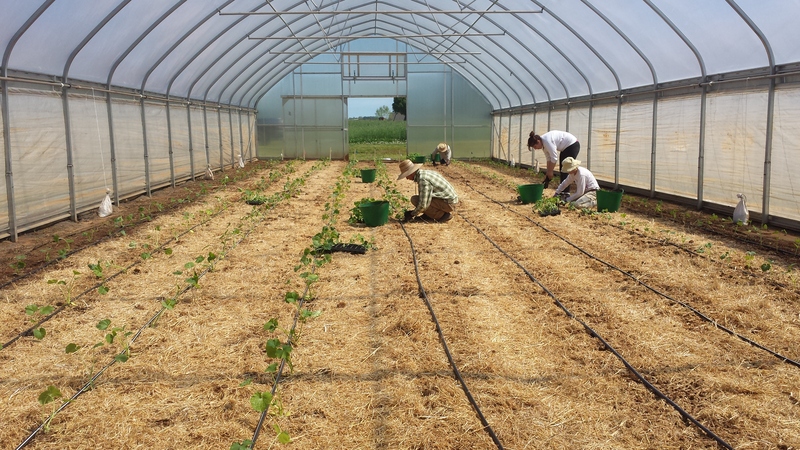 Yesterday we prepared one high tunnel for planting by making rows, applying fertilizer and compost, and running drip irrigation. 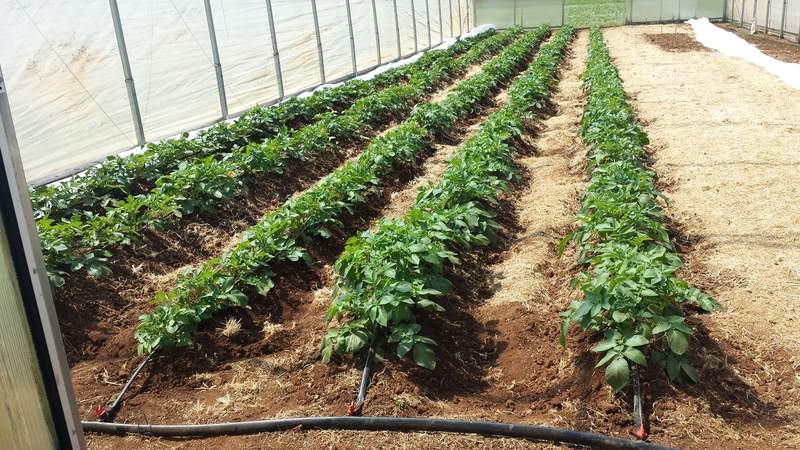 We planted half of the high tunnel with red gold potatoes, to be harvested in early June. 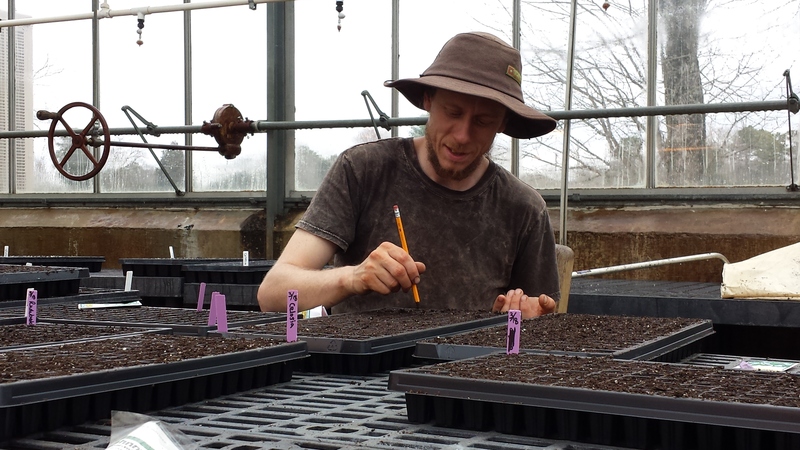 Yesterday we also seeded cucumbers, squash, and zucchini that will be transplanted in the high tunnels, along with several varieties of flowers that will be planted in the field. 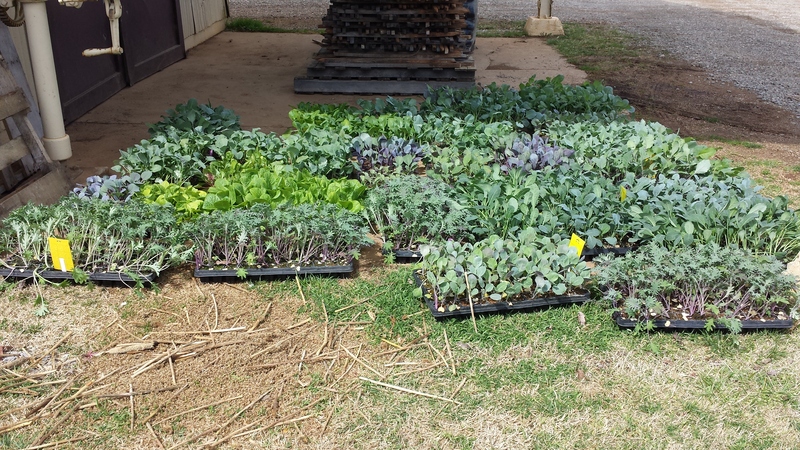 Currently, we have all of our spring crops such as broccoli, kale, kohlrabi, and purple cabbage hardening off outside. These crops are ready to plant, but could not be planted today due to the windy weather. 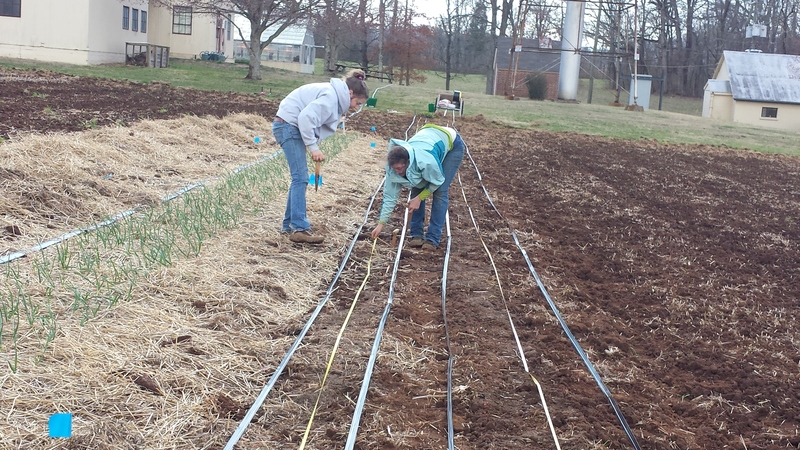 Alas, today the interns braved the wind in order to prepare rows to transplant later this week! 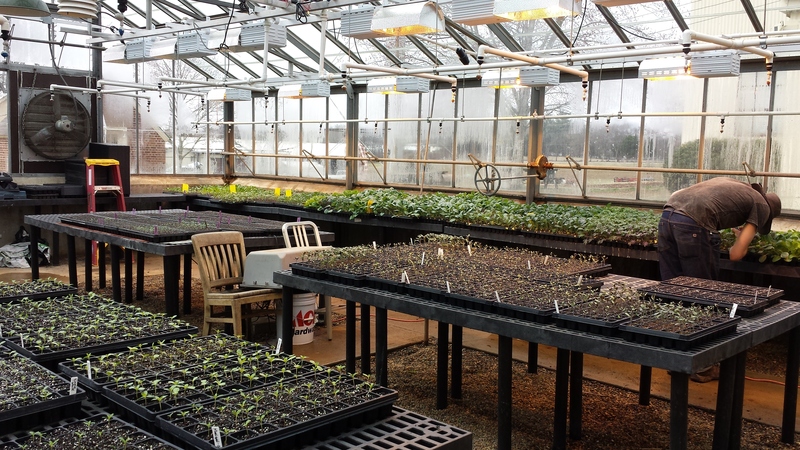 We hope to work more this week and finish planting as the weather permits! Regardless of wind or clouds, it has been a beautiful week on the farm as the planting season begins. About a week ago in my ESS 210 class, my professor screened a 13-minute clip on soil fertility to accompany his lecture on the similar subject matter. The clip summarized my thoughts, positions and approach to organic farming – a system that should support only the natural biodiversity of the soil which, in itself, is the full potential of the soil to improve its organic matter content and balance the quality of the soil with the minimum amount of external inputs by way of organic residues. Even though standardized by the NOP and other governing entities, organic agriculture has the potential to verge into conventional agricultural practices to a certain regulated standard. This will result into more damaging agricultural issues that have become a problem for the already approved synthetic products being used in organic agriculture today. The clip explores the idea that the fertility of the soil without synthetics or external inputs can produce a soil with high organic matter that can support plant growth and sustain soil quality to the extend of improving the soil’s fertility year after year. The video clip suggested that application of compost should be the only external input use to improve the soil fertility – it has been documented and experimented scientifically to improved yields, control weeds, pests and certain diseases, and a develop sustainable soil that will improve and grow in top soil inches year after year. Compost, just compost! If the intention or the potential of a plant is to create seeds and the soil to become fertile and the human to protect the integrity of the soil for food growth; this correlation between these three entities within each ecosystem across the globe represents what “true fertility” should be – the freedom of the plant, soil, and human to produce on their own terms. Soil In Good Heart is a brief look at why good soil fertility is vital to life. It illustrates how valuable soil is to society and how it’s been neglected at our peril. The clip is a 13-minute excerpt from a full-length documentary entitled Symphony of the Soil. The clip is an award-winning clip receiving Special Jury Recognition Award at the Aspen Shortsfest Film Festival in 2010. All wealth in today’s society comes from the SOIL. Think that the city is a dead zone for nature’s bounty? Think again. 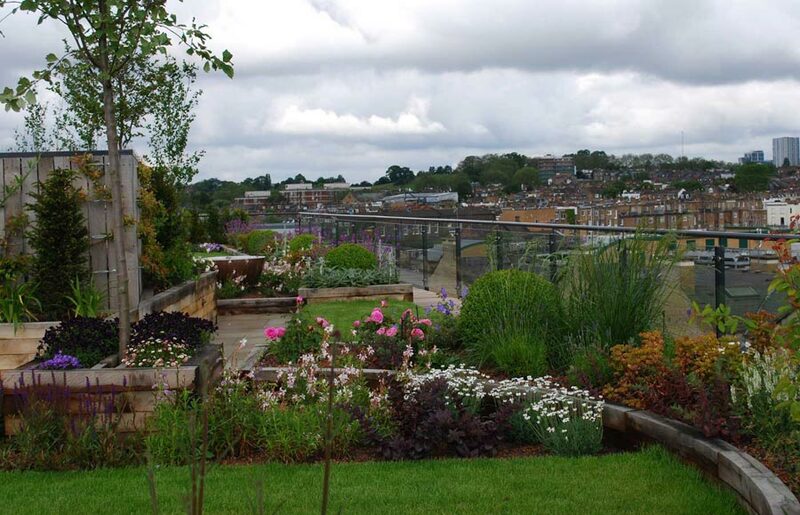 Urban rooftop gardens provide a variety of benefits for those who dwell in an urban environment. The vast space available on rooftops is often a most overlooked area which, ironically, patiently overlooks us as we walk in the city below. People are increasingly beginning to realize that these spaces have an abundance of natural resources to be accessed. Rain water and sunlight, as well as ample breezes, are there to be harnessed for human use. It is not necessary to depend upon food from far off lands when living in a city. Healthy natural foods can be ours in the city, free of charge, with a little planning and some innovative construction. The city of Chicago Department of Environment offers a free booklet that can be accessed on the web, called Guide to Rooftop Gardening. 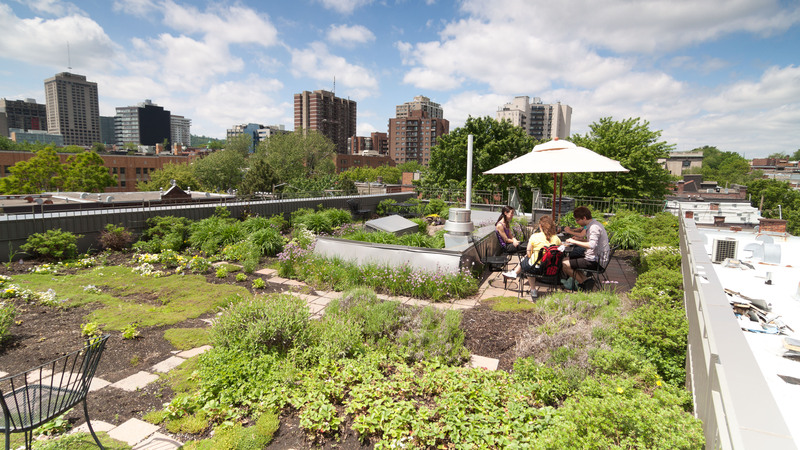 The booklet outlines the benefits of rooftop gardens and other “green roof” alternatives. 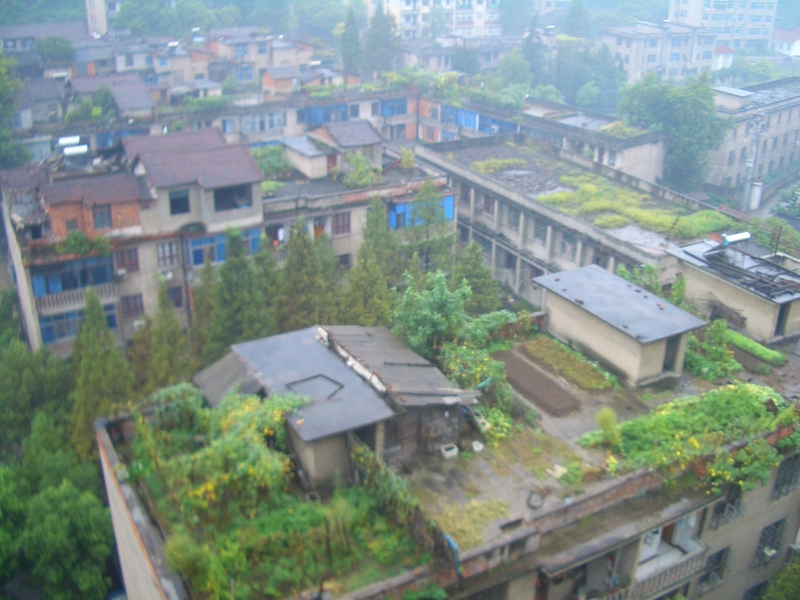 The beneficial use of once-wasted space is not the only benefit of green roofing or rooftop gardening. The phenomenon known as the urban heat island effect, caused by dark colored and bare surfaces on the tops of buildings, is greatly mitigated by these practices. Urban heat island effect often causes temperatures to stay much higher in areas where cooling costs can be a serious issue, especially in the summer months. The higher temperatures increase the smog in an area and are a hazard to human health. The carbon dioxide and other effluent from autos and industry are trapped by the heat island and reduce air quality. Plant life on rooftops not only clean the air through photosynthesis, but the lighter colors of materials and flora in a rooftop garden will reflect sunlight and cool ambient temperatures which reduces the direct ill effects of urban air pollution. The green roof concept can be applied to almost any building. Even in a suburban setting, a small green roof setup will help insulate a structure and reduce heating and cooling costs year-round. Rooftops in the city should come standard with solar panels and wind turbines considering the fossil fuel crisis currently plaguing the minds of sustainability advocates and well-informed citizens, alike. Rooftop gardens can delay the peak flow of falling rainwater and store it for use by plants. Pursuing a healthy hobby with aesthetic and physically rewarding outcomes are other reasons to get into urban rooftop gardening—not to mention, you could eat for free and the view is often a unique and beautiful vantage compared to the often cramped and busy city below. 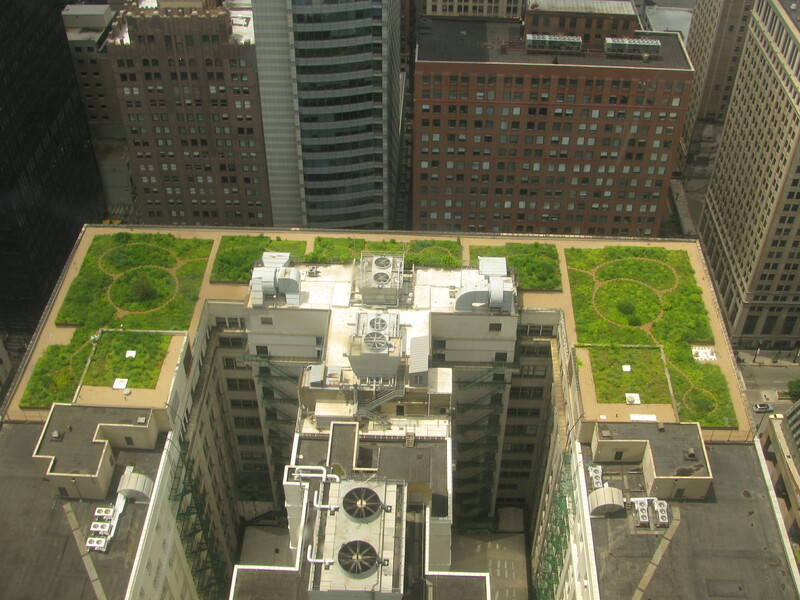 Chicago City Hall green roof is a beautiful site among the drab gray of the city. A rooftop in Camden, NJ. This was taken from an add posted by a company that will plant and maintain rooftop gardens for clients, a great business model for horticulture enthusiasts and sustainability proponents with some green-thumb skills. This rustic looking scene is pleasantly enhanced with the lush meadow-like feature covering the red house’s rooftop. 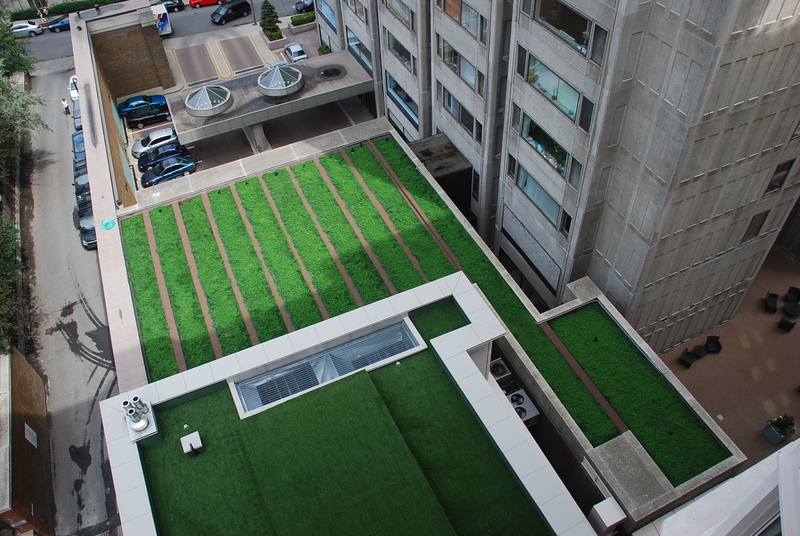 Green rooftops can be for commercial business . . .
. . . for residential application . . .
. . . and for pleasure. Wherever you may find your self, working with available natural resources to enhance your quality of life is always the right thing to do. Many studies have shown that humans benefit from a more natural environment in mind, body, and spirit. Better air quality, reduced climate control expenses, and even better memory and cognitive function are all rewards to be reaped with green-spaces. Why not incorporate one into the often overlooked spaces that were looking over us all this time? All photos sourced from the web and are displayed under fair use. 2014 CSA currently open for enrollment! You can enroll by mail using the form at the end of the information packet above, or online by following this link. If enrolling online, please follow the options for “UT Organic & Sustainable Crops”, then add CSA share to the cart. Totals due will appear after the payment schedule has been selected. As we prepare for an abundant season of food for our CSA members and market, we are also planning food sources for the pollinators which perform a valuable service on the farm. While bees are often the first pollinator which comes to mind, there are a variety of pollinators we depend on. One of the most lovely is the Monarch. The adults may feed on the nectar of many plants, but the species depends primarily on a single genus of plants, commonly known as milkweed for egg-laying and as a food source for the young larvae. The insectary, is a portion of the garden dedicated to plants and flowers which invite pollinators and other beneficial insects to the garden. The declining population of this pollinator has greatly concerned scientists lately. There is a worry that they could become extinct in a very short time unless something changes. 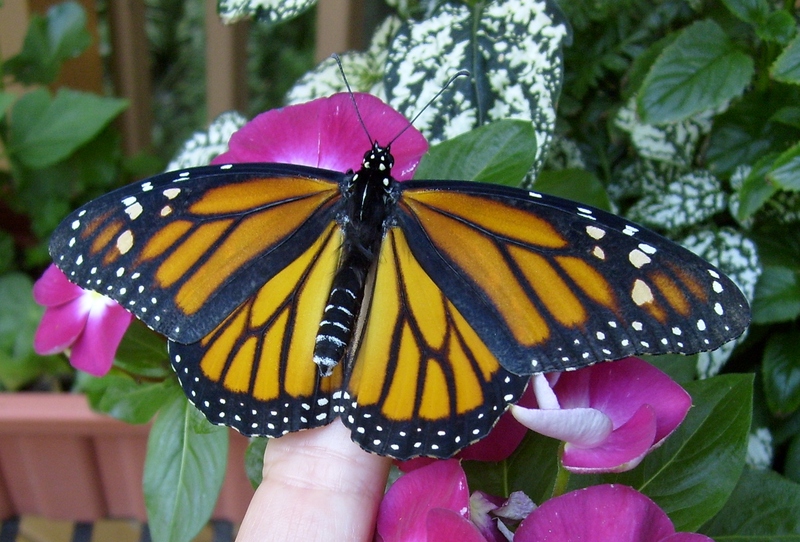 Many people love the Monarch, and, unlike some insects; it is an easy creature to admire. It is beautiful; it has a unique migratory habit, and great cultural significance. In Mexico, they symbolize the souls of those who have passed on, and the migratory return in November coincides with the holiday, the day of the dead. Across North America the Monarch is a symbol of summer, where butterflies frolicking in the sun rank right up there with cold watermelon and a day at the lake. Pathogens and parasites have an influence on natural populations of Monarch. For this reason, many people are raising the young caterpillars from the egg stage to maturity in a protected environment in order to increase the reproductive success of the Monarch. When combined with these natural pressures, human influence, which leads to vast landscape changes and the introduction of toxins into the environment, increases the difficulty for the population to remain stable. Modern agricultural methods are directly related to the plight of the Monarch. 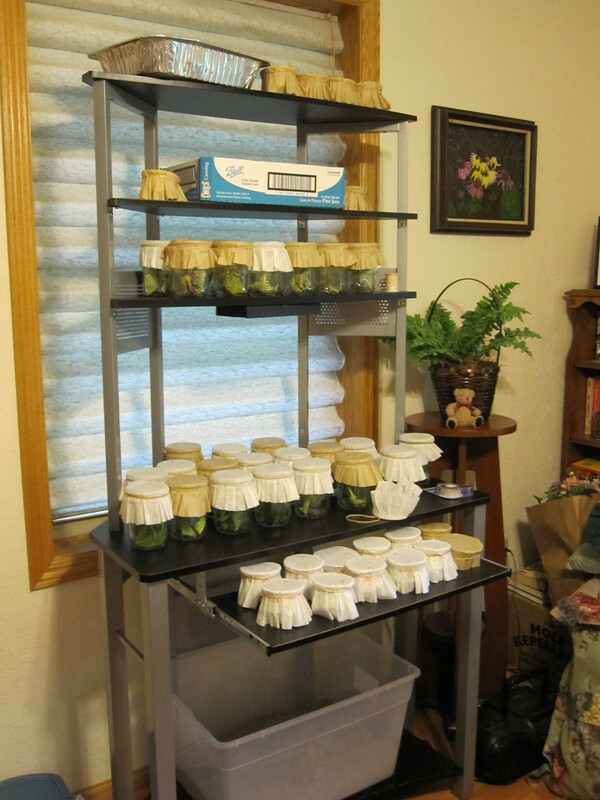 A collection of Monarch eggs and larvae being reared to maturity. 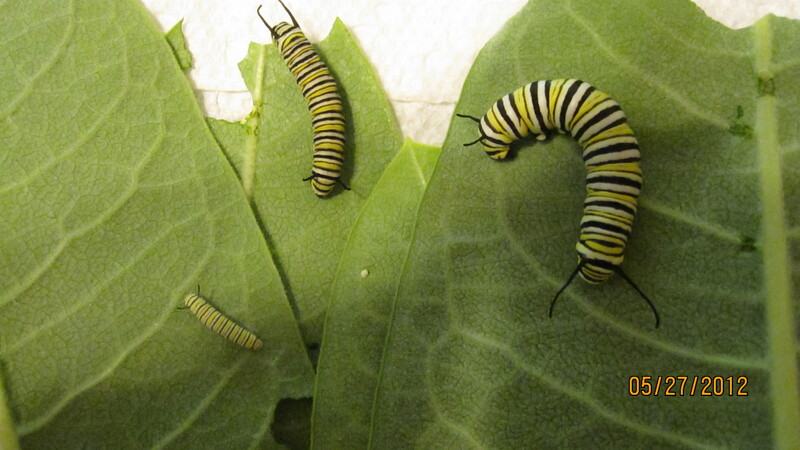 Monarch egg (center) and larvae at various stages of maturity. Photo by Brenda Keith. Modern agricultural trends which affect the Monarch include: farm consolidation, increasing herbicide use, and pesticide use. The consolidation of small farms into large industrial food complexes reduces the amount of traditional field border which often contained the food plant of the Monarch, Milkweed. Herbicide use has increased, due to modified crops which will tolerate glyphosate and its application to ever larger areas on consolidated farms has eliminated healthy Monarch habitat in these areas. Pesticides are not aimed at any particular species, but an entire trophic level. There is no way to distinguish among the good insects and the bad ones. The use of these chemicals in agriculture, horticulture, and increasing availability to homeowners who may not fully understand the consequences of their widespread application greatly reduces the number of safe places in the landscape for the migratory Monarch. “Milkweed”, the food plant of the Monarch caterpillar, includes more than 100 species of the genus Asclepias and suffers from a negative label. When classified as a “weed” or “pest” elimination becomes the natural goal. In the past we have battled with pests and considered them such an invincible foe that we did not imagine that they could be reduced to a level of concern. We are so invested in the battle which seems justified by a negative label that we fail to see the essential role that they fill and how it may connect to us. But history has shown us to be quite successful in eliminating pests. The Passenger Pigeon and Carolina Parakeet, both now extinct were both considered agricultural pests in the United States. One advantage of Organic agriculture is that it treats the farm as an agricultural ecosystem where problems are ideally managed through rotation, timing, and increased diversity rather than chemicals. This is good news for wildlife, and us as well. Unfortunately, most insects do not capture our hearts and imaginations the way that the Monarch does, yet we are only a few steps away from them on the food chain. Biologists know that in any ecosystem, problems in one portion of the food web, often lead to trouble in other portions of the system, including the human societies which are a part of them. For this reason indicator species are often selected which serve as a measure of the health of the ecosystem, and they also serve as an early warning system if something is wrong in the system, like a canary in a coal mine. Some indicators are chosen because they are susceptible to some environmental factor, such as water quality or toxins, and others are chosen because of economic or cultural significance. If the Monarch is viewed as our canary, it’s not doing so well. Glyphosate, which has virtually eliminated milkweed from farm ecosystems, has also been linked to several human illnesses. Residue remains on foods and has even infiltrated the public water supply at low levels through agricultural run off in some areas. Despite growing health concerns and questions of safety with this chemical, permissible levels are increasing rather than decreasing. If you’d like to learn more about Monarchs and how to help their populations, the Monarch Larva Monitoring Project (mlmp.org) is one place to go for information and to participate in this citizen science project. Even if you do not wish to become involved in research, to increase your enjoyment of the Monarch, you can make certain to avoid harmful chemicals on flowers which may be useful to pollinators and be sure to plant some milkweed to help this migrant complete its annual cycle. Here’s a link to a recent article about health concerns with glyphosate exposure. My thanks to Brenda Keith for providing photos of the wonderful work she does each year, helping to boost populations by raising larvae to maturity. 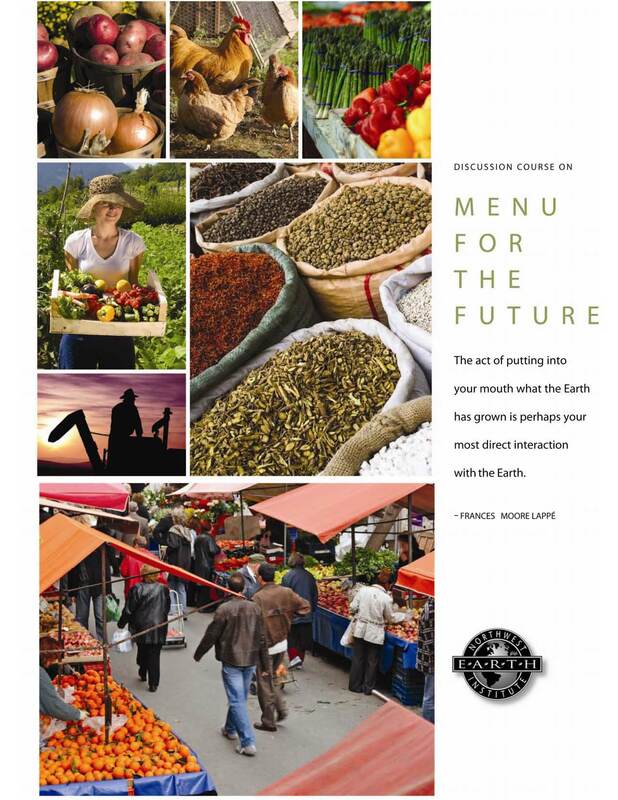 Tomorrow night is the last meeting of my “Menu for the Future” discussion group. This discussion group was organized by Slow Food Tennessee Valley, and incorporates essays compiled by the Northwest Earth Institute (http://www.nwei.org). The short essays are written by well-known authors such as Wendell Berry, Michael Pollen, Marion Nestle, Steven Hopp, Frances Moore and Anna Lappé amongst others. The purpose of the discussion group is to explore the connection between food and sustainability and to share our thoughts and personal experiences–not necessarily come to consensus. Some of the topics included the effects of our modern, industrial food system on the environment, our culture and our health; the economic and ecological impacts that go hand-in-hand with how our food is grown and prepared; and how we can make a difference through our food dollars. My favorite section was on food justice issues, including ways to incorporate healthy food choices into low-income and minority demographics and the politics of hunger in America. I was particularly incensed when reading an essay by Frances Moore Lappé on hunger and scarcity. The truth is, food scarcity today is a myth. There is enough food produced today to feed the world. The problem is a lack of resources and access to healthy food. Meanwhile, our industrialized food system contributes to abuse of our soil, water and air quality so that in the not-too-distant future our food scarcity fears may be very real. Additionally, the loss of crop diversity and consolidation of seed into fewer and fewer hands due to agribusiness self-interest is a real threat to food security. Marion Nestle asks: who benefits financially when our diets cause sickness and disease? Who benefits when there is a cheap, abundant supply of unhealthy food occupying virtually every shelf in the grocery store and on every block of our city squares? Who benefits when the burden of obesity and health is put squarely on the shoulders of the consumer, while food processors and marketers laugh all the way to the bank? Food injustice is rampant in our society and I think its important to work together to recognize this and fight for fairness and accountability in our food system. My personal belief, and one that is shared by Slow Food–is that the access to good, clean and fairly produced food is a right and not a privilege. I thoroughly enjoyed this compilation of essays and I am sad to have it end…although I am excited for our celebratory potluck dinner that will wrap up our discussion group meetings. Maybe I will incorporate this discussion into the UT Organic Crops Internship Program this summer! Manny, Casey, Geoffrey, Shannon, Jeff–are you up for some summer reading?